These Party Pretzels are a great kids recipe and would be a fun activity for a play group or party. Who can make the most unique pretzel shape? You can use coarse salt, or none at all if you want to reduce sodium. Make this easy for preschoolers by making the dough and 'rolling' it into thin 'ropes' they can use the ropes to make what ever design they choose. 1. In a large bowl, dissolve the yeast in the lukewarm water and stir in the eggs, oil and milk. 2. In a separate bowl, combine all of the dry ingredients and then add to the egg and oil mixture. 3. Knead for 5-10 minutes until the dough is smooth and rubbery. 4. Roll the dough into ropes, about the diameter of an adults' pinky finger, and about 1-2 feet long. 5. 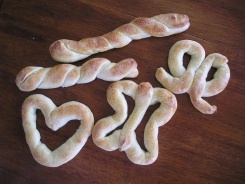 Now it's time to be creative, make as many different pretzel shapes and designs you can. Place each shape on a greased (or parchment lined) baking sheet. 6. Brush the tops of each shape with egg and sprinkle with salt if you choose. Bake at 425F for 10-15 minutes. Then enjoy!! Find more great Every Day Edible Crafts like the Party Pretzels!